I have a new love. It has replaced what I thought was irreplaceable. 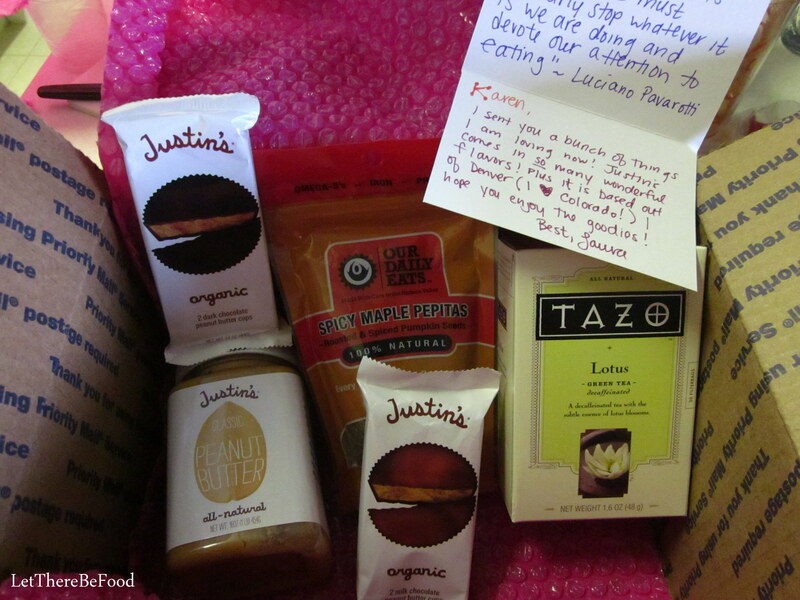 This shift in food alliances has happened courtesy of April’s Foodie Pen Pal exchange. This month I was assigned to send a package to Courtney in North Carolina, a high school senior headed to East Carolina Honors College to study Nutrition Science in the fall. She’s quite delightful, and we discovered we had a lot in common including our love for chicken salad. 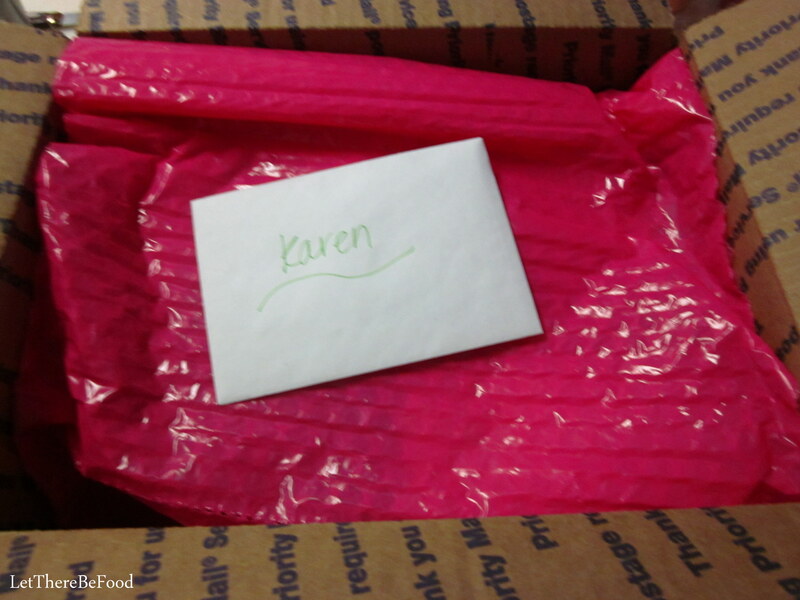 It was super fun to shop for her and send along her very first Foodie Pen Pal package! She also started blogging this month with the April Foodie Pen Pal reveal being her first post. Check out Glitter and Tomatoes to see what she got! 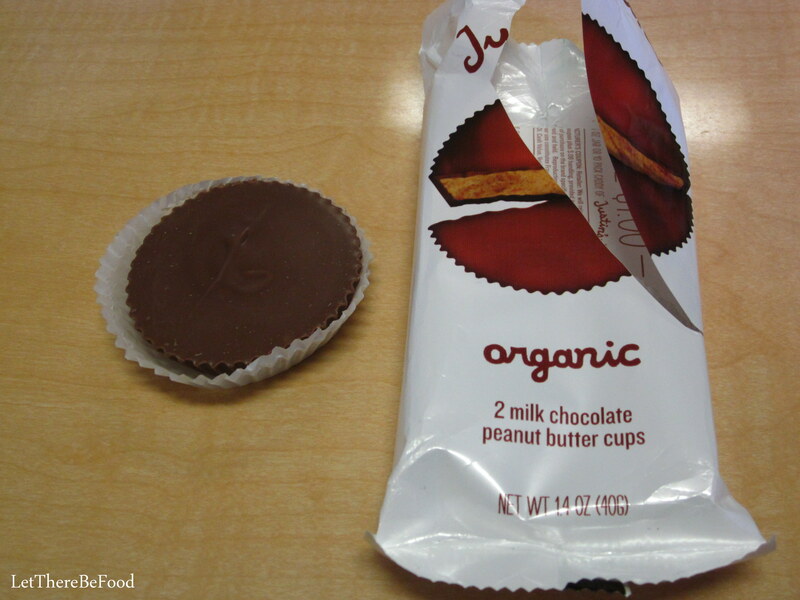 I received my box of treats from Laura in New York who, without knowing, sent me some of my most favorite treats ever: organic chocolate peanut butter cups. Cue the angelic music as I lifted not one, but TWO packages of these delectable packages out of the box. We’ll come back to these in just a moment. I’ve only seen the mini packages of Justin’s all-natural peanut butter before; this was my first time to encounter a full-sized jar, and I am so humbled that she saw fit to bless me with one. I am excited to use it, but I’m waiting to open it until I’m all finished with my grocery-store brand of peanut butter. Laura, you may have just ruined me on peanut butter for the rest of my life. 🙂 I will be sure to report back. 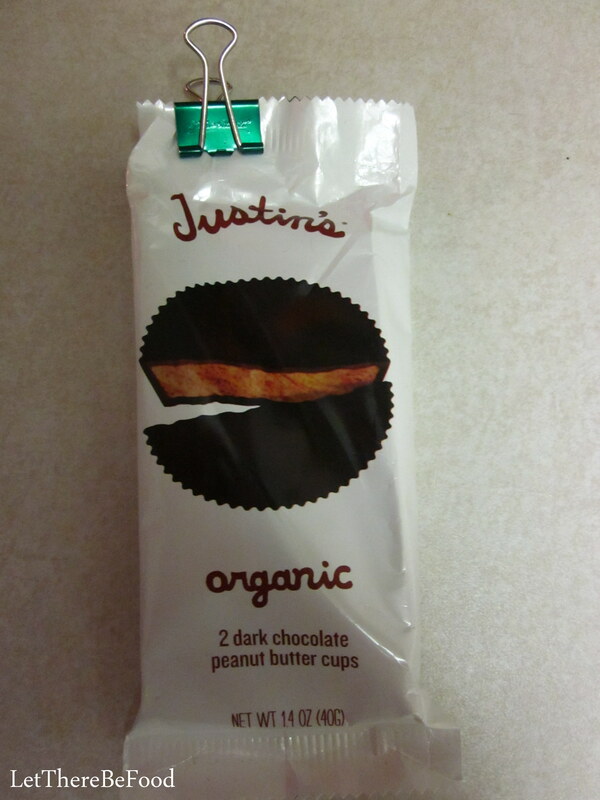 In addition to the peanut butter, I was graced with both a milk chocolate and a dark chocolate set of organic peanut butter cups from Justin’s. I did not tell Laura that peanut butter cups are my most.favorite.candy.ever. How did she know?? Y’all, these peanut butter cups are life-changing. Life-changing. I’ve been a die-hard Reese’s peanut butter cup fan for AGES. I don’t know that I can go back. There's even a coupon inside for future savings! These chocolate peanut butter cups are extraordinary. The chocolate is smooth and creamy, without being overly sweet. Similarly, the peanut butter is not overly sweet either. I’ve seen how they make Reese’s on television so I’m aware of how much sugar goes into those nuggets. I eat them, but I always need milk or water or something to rinse my mouth and throat when I’m done because it’s so sweet. Plus, somehow I also gobble them up, almost mindlessly. Not so with Justin’s peanut butter cups. When I first ate one, I was aware it seemed less sweet, but more flavorful. The chocolate flavor comes through more clearly and intensely. The peanut butter flavor is just more peanut-buttery without so much sugar masking the taste. I also only wanted to eat just one cup that day. It was quite sufficient, so I saved the second one for another day. It was just rich enough to meet my taste bud needs without going overboard. Whether this makes sense to you or not, please go find you some of these and try them. I promise you that you won’t be sorry! Reese’s, please consider this your official break-up notification; you will always be second fiddle from here forward. 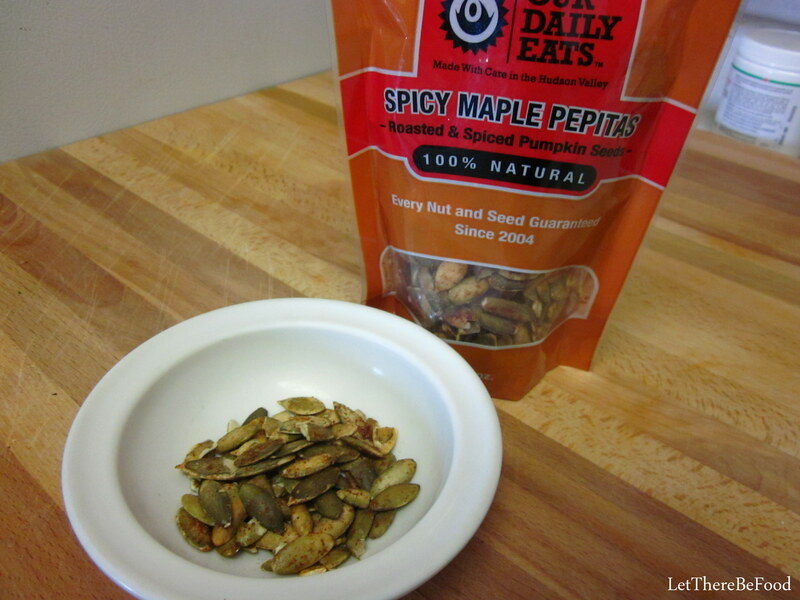 The other item that I’ve tasted so far and thoroughly enjoyed is the Spicy Maple Pepitas! I opened them just after taking a picture to give them a try. My boyfriend and I both tried a small handful, and they elicited the following comments, “Wowser, these are good!” and “Uggabooga, these bite back!” He was right on both counts. Since they are sweet and spicy at the same time, I can eat a helping of them without too much problem until I notice that my nose is starting to run. But since I do love spicy foods, this is just fine by me. 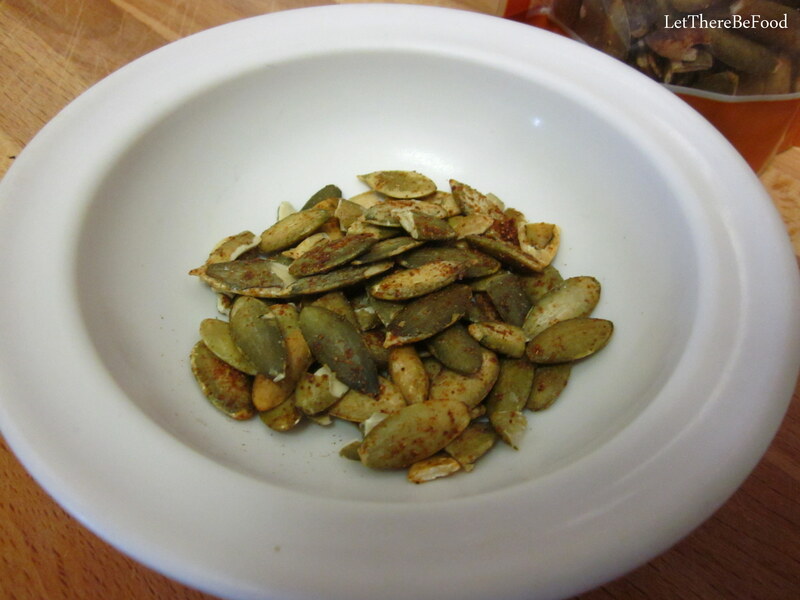 I shared some with a few students at work, and they enjoyed the pepitas as well. I’m not sure I would have tried these on my own, so I’m glad Laura sent them my way. It’s been another successful Foodie Pen Pal month for this TX gal! It is quite delightful getting to know other foodies from around the country, swapping treats and food love. If you are interested in participating, check out the blog of the mastermind behind the project, The Lean Green Bean. Lindsay has all the details you need to sign up and get involved. Just let her know by filling out the form by May 4th. There is a $15 spending limit per package/month, and you send your package out by the 15th, after receiving your match on the 5th. Every month the Pen Pal program gets larger so I encourage you to be a part of the movement sweeping the nation. You know you want to! You can also check out the blog link-up on Lindsay’s blog to see what other fun packages were sent around this month! Come back and visit here for more tasty recipes and Foodie Pen Pal fun next month. If you subscribe, you won’t miss a thing! See y’all next time and happy eating! those pb cups are the BEST! I love the “Justin’s” products! My favorite is the hazelnut butter! !